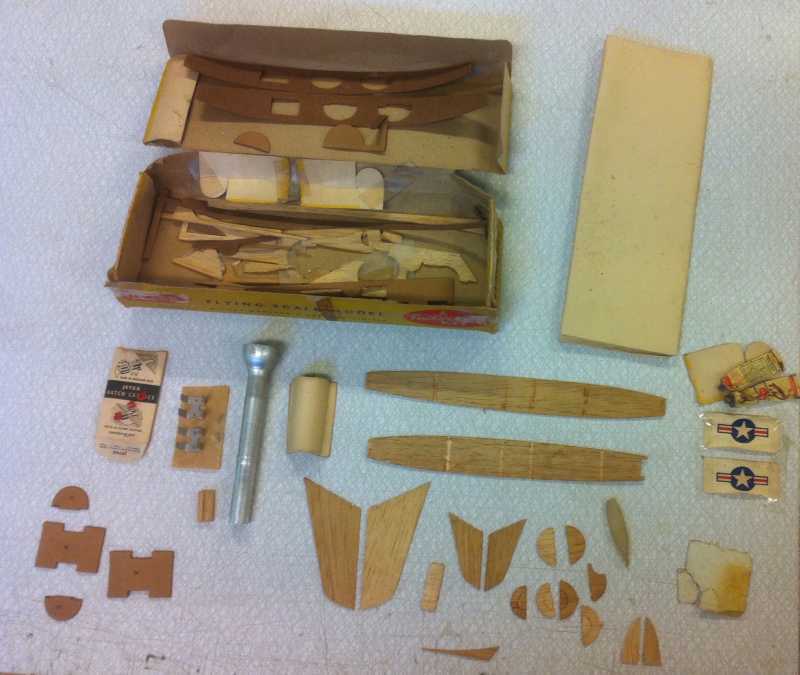 Almost finished with the Gnat I found this not at all collectible Skyrocket kit (if it even qualifies as a kit) on eBay. At a quick glance it looks as the absolute opposite to the Gnat kit: It has a plan, but almost everything else is missing. Or is it? 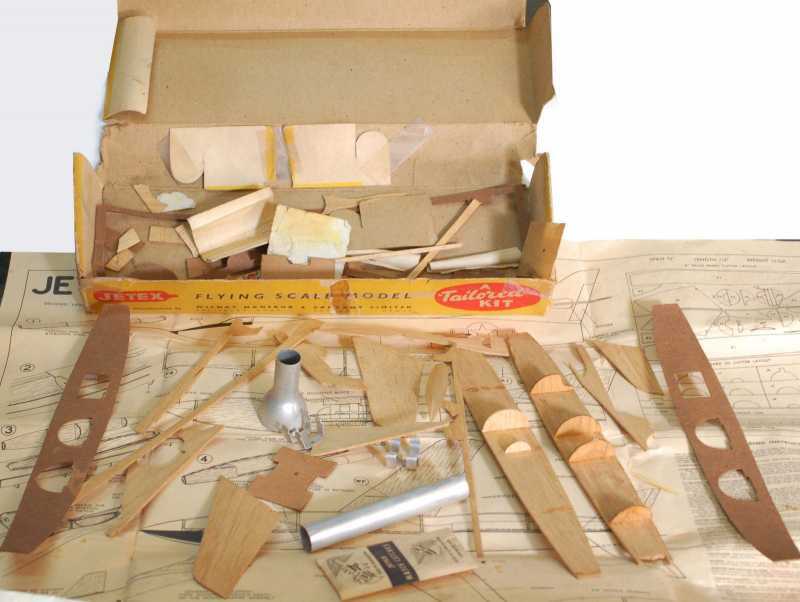 A quick inventory shows that most of it is actually there, augmenter tube, motor mount, preformed engine hatch and hatch catches, wings, tailplane, part of the fin, keels, canopy and at least one of all body formers. 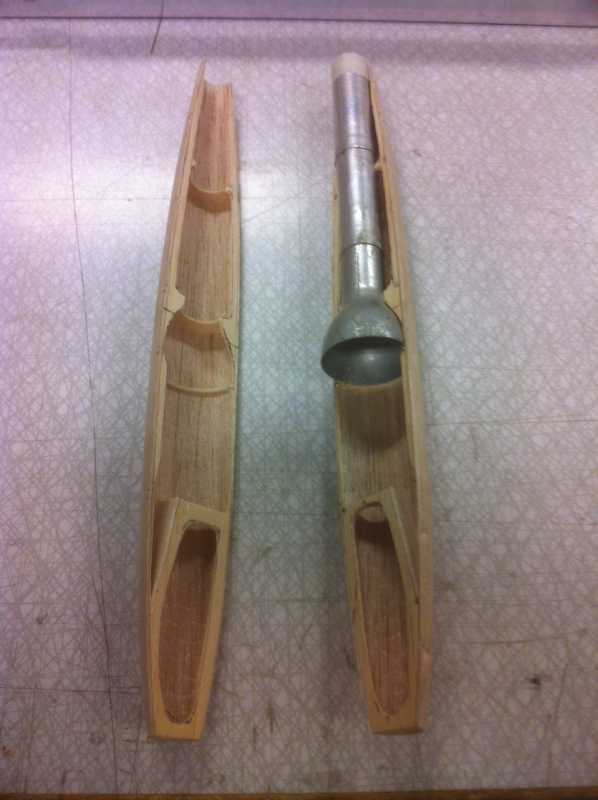 The only things missing are the preformed body halves with jigs, and the nose cone. and from the other side, with nose cone. and outside with wings and tail. 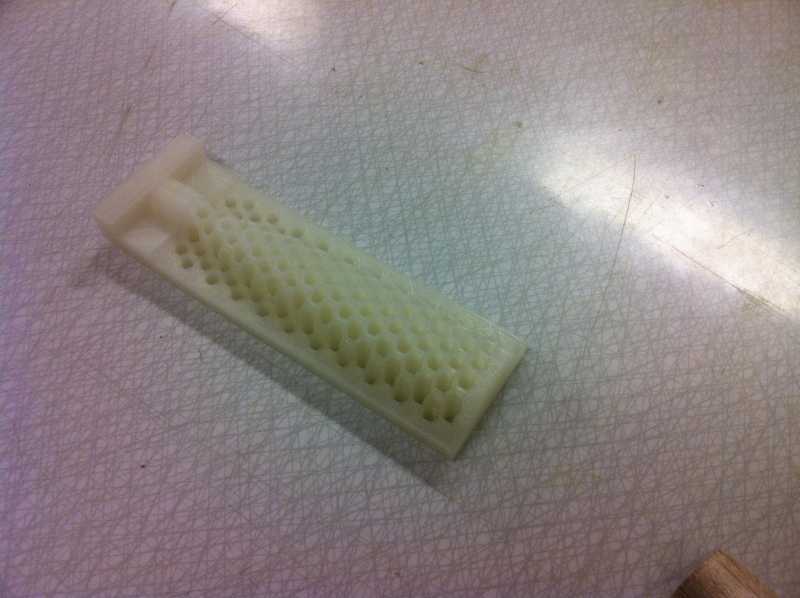 Next step is to print the molds and find a procedure to make new body halves. 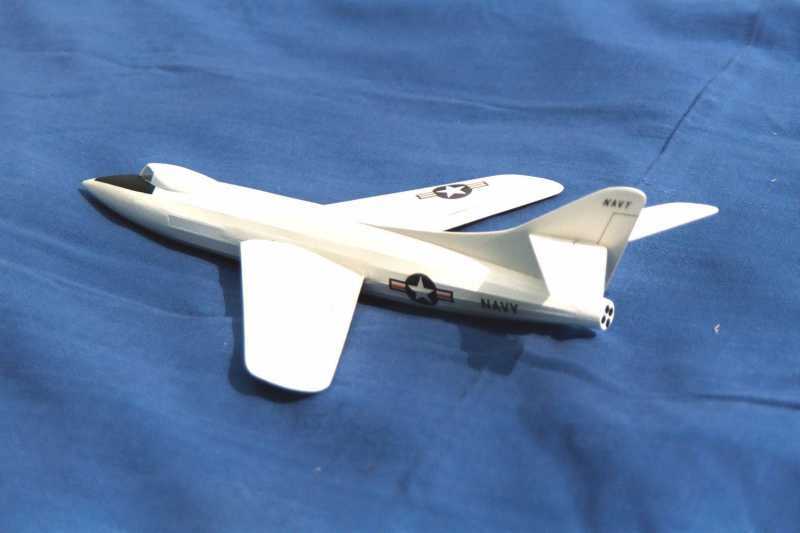 The Skyrocket seems to have less wing area than the Gnat, but seems to end up around the same weight. The last remark in the building instruction is:"Remember this is a model of a supersonic aeroplane, so do not expect duration type performance." Or in my interpretation, to make it fly at all, I'll have to use all the tricks in the book to keep it light. Maybe an ultra thin shell with carbon fiber reinforcement and reduced number of formers and keels? By the way, are there anyone that has the complete kit that kan tell me how the nose cone should be made. Is it thin vacuum formed plastic, like the canopy, or is it more like molded and 1-2 mm thick so it can take a hard landing? great progress and you are making a splendid job of the Skyrocket. I was wondering who had outbid me for this one on eBay. Now I know! i'm glad it went to a genuine modeller rather than a collector. Andy Blackwell has a complete kit and can advise on the nose cone and the decals which I expect you will have to recreate. 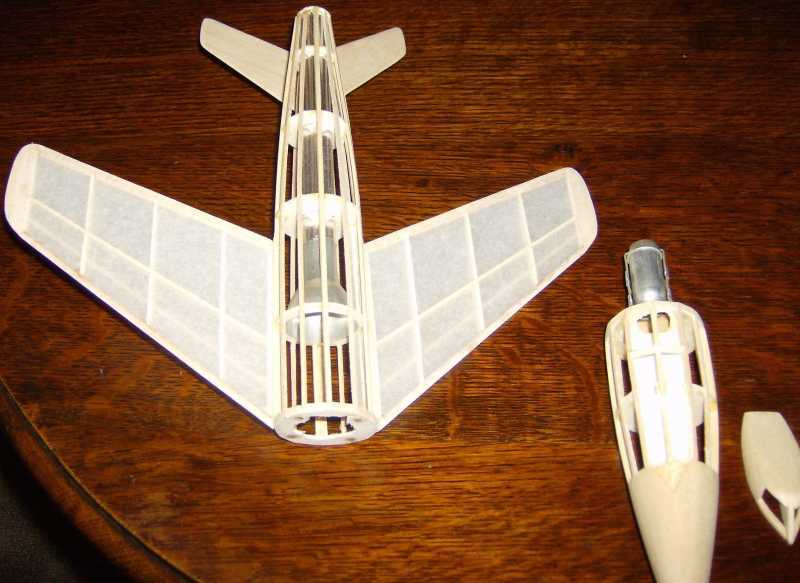 Andy also has a scratch built Skyrocket with an internal motor and can advise on the (tricky!) trimming. As you say, with this model, lightness is all - my 'stick & tissue' Skyrocket weighed under 30g and flew well. Above: stick 'n tissue Skrocket flew well at 30g all up. The Tailored model I suspect will be quite a bit heavier - I look forward to your data for the finished model. So I have been experimenting with molds. First I made a half skin to try it out. Even a relatively stiff balsa sheet gave a surprisingly good result, so I decided to continue with just a single sheet of balsa and no lamination to save weight. I believe that the lamination is of more importance to make the skin survive in the box over a long time (50 years or more?). Lesson learned is that a wet sheet of balsa squeezed between two plastic surfaces NEVER dries, so I had to perforate the male part of the mold, and then it dried nicely. The PLA-plastic used in the mold can not take any heat without softening and warping, so drying in the owen is out of the question. Next the full size skin. 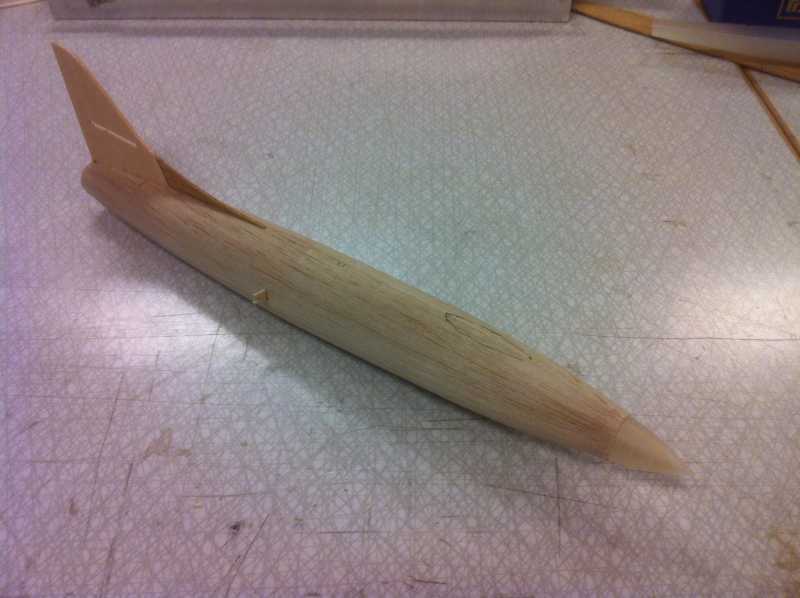 Using a relatively light 1mm balsa sheet for the skin, and a little stiffer 1mm sheet for the keel and formers (instead of 1,5mm in the kit), and cutting away as much as possible of the keel, the finished body half is surprisingly strong but only weighs 2,2g. It looks very promising! So now, on to the other half. Second body half, and the two halves joined together. Total weight of the joined body, including augmenter tube but ex everything else, is around 11g, so hopefully the final weight should end up well below 30g this time. Next step is air intakes and engine hatch. 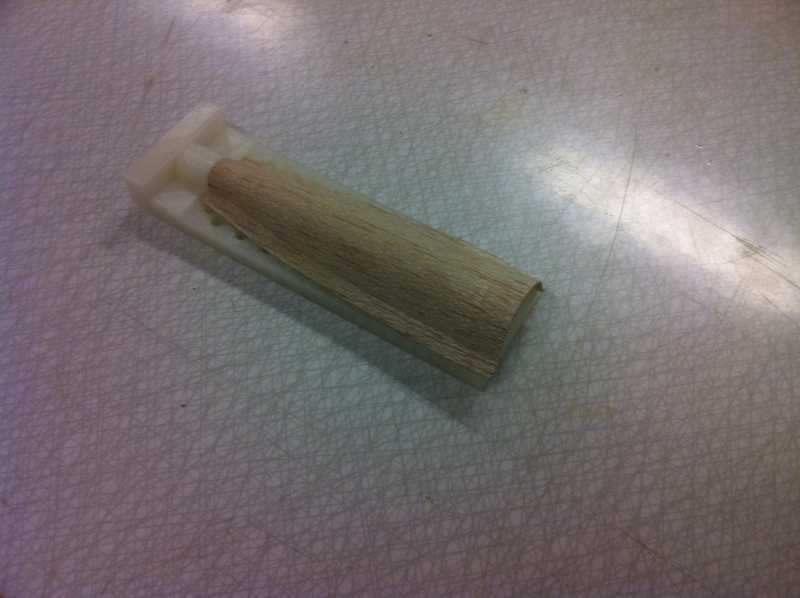 I have laminated a new engine hatch with two layers of 0,8mm balsa and one layer of paper in between, I just hope that I will get it out of the mold.